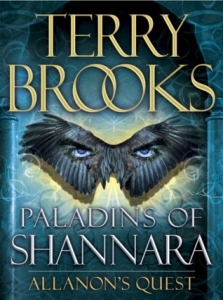 “Paladins of Shannara” is a series of stories dedicated to some of the most famous characters from the world of the Four Lands, the scene of action in the eternal saga ” Shannara” of the best-selling author of “New York Times” Terry Brooks. fantasy story, whose only flaw is that it is too short. The perspective of the famous Druid is more interesting, but does not affect the sense of mystery and power that emanates from it. His enemies did look absolutely ruthless which as if increase the drama of the story of the classic first novel in the series - “The Sword of Shannara.” I recommend this story to all who love Terry Brooks and the world of the Four Lands. sometimes is doing services to those who can afford it. But when to his camp comes the beautiful and mysterious Liriana, things change. The young woman looks both strong and vulnerable, determined but also desperate. Gareth Jax is the last person who can help her. Her hometown Tazharin, has fallen under the sway of an evil wizard, a monster that drains the souls of his victims. Lariana has already lost her brother. There is no one to help her town. Even the brave warriors of the Border Legion will not be able to deal with the wizard. and nobody can stop him! I think that this is a very well written fantasy story. Terry Brooks is a great storyteller and those who love the world of “Shannara” will once again have a chance to sink into his superb style, describing a harsh, broken, but still a beautiful world. The emotions that Brooks describes with words are strong and dark this time - besides the typical “Shannara” horror and suspense this time there are threads of a deep melancholy that at least a little bit unveils some of the mysticism, that veiled Gareth Jax. For some the book may even seem too dark with a crushing finale bearing hopelessness even in victory. But, as I said above, it does not matter. Gareth Jax is primarily a master of weapons, the most phenomenal warrior ever portrayed in a fantasy book and any adventure of his is a great gift for the reader. This is no exception. A Day Late and a Dollar Short by Terry McMillan: Engrossing…!